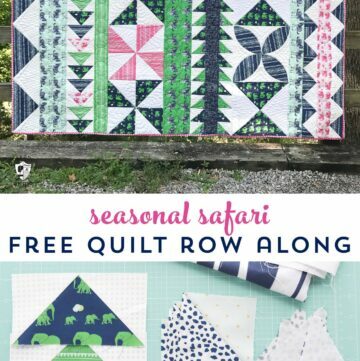 Today kicks off our Seasonal Safari Quilt Row Along! I hope that you will join us! 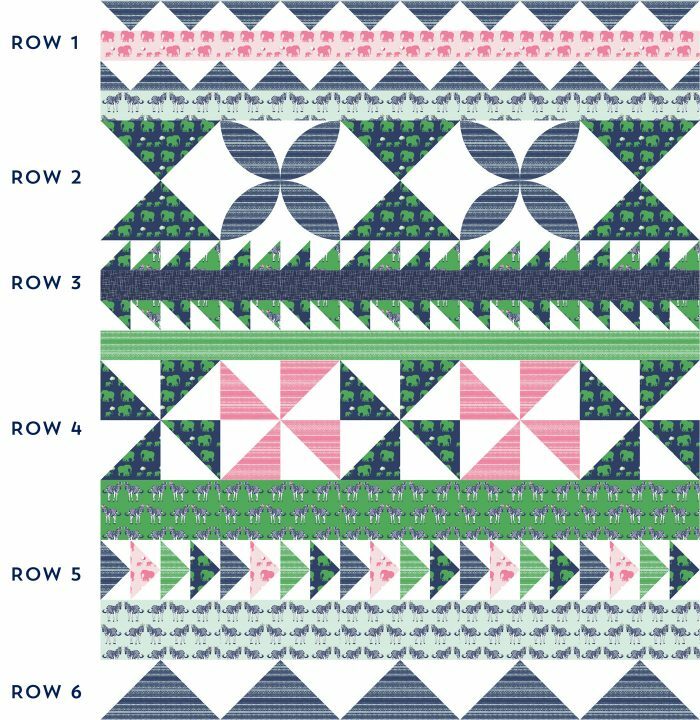 This is the first tutorial in the series and we are “starting in the middle” and creating Row 4 of the quilt! Keep reading to find out how to join in. 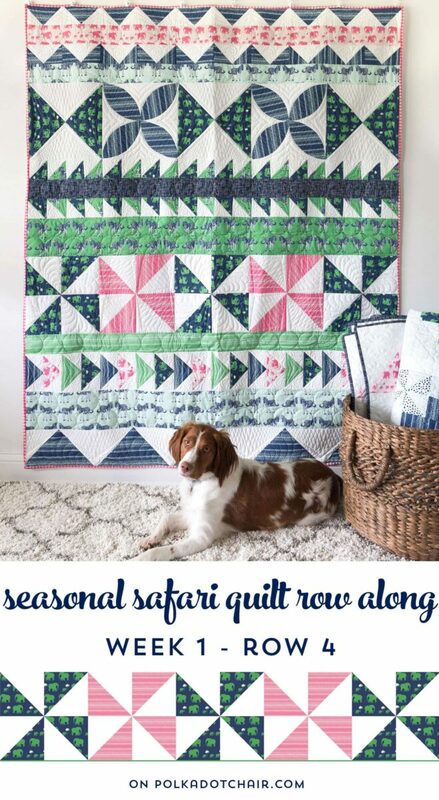 I hope you’re excited to start the Seasonal Safari Quilt Row Along! I’m really glad to hear that so many of you want to join in. To see all the posts in this series CLICK HERE. Before we get started I have a couple of “housekeeping” issues. 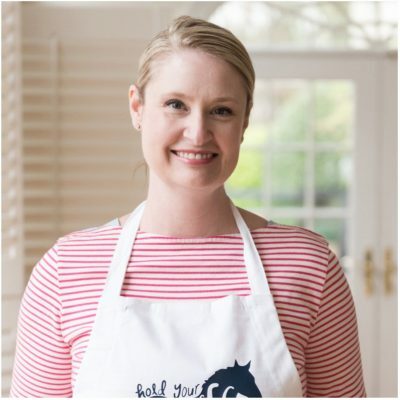 A few weeks back a reader mentioned that she’d love to be able to share what she’s working on without all of her Facebook friends seeing it (if she uploaded her project to my public Blog Facebook group). I actually totally understand where she’s coming from. Sometimes I think my friends and family think I’m NUTS with all of this quilt and craft stuff. So it would be nice to have a place to share with other like-minded individuals separate from the public Facebook space. The group JUST started. Even if there are just a few of us to start I think it will be fun and just grow over time. 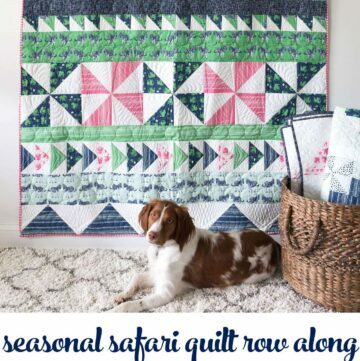 I”ll post the links to all of the tutorials for the Rows in the quilt along with some other fun quilt tutorials that I think you might like. You can also upload photos of what you’re working on! To join the group just CLICK HERE. If you join, make sure you read the pinned post and play by the “rules”. You’ve probably noticed from the title of this post that we are not going to create the rows in order 1-6. We are actually going to start with row 4 on the quilt. 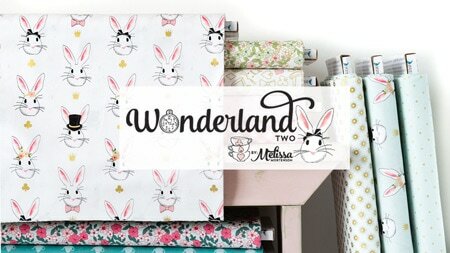 I want this quilt to be a skill builder quilt and I’ve broken down the rows by simplicity. That way you learn as you go and stretch your skills a little bit each time you create a row. 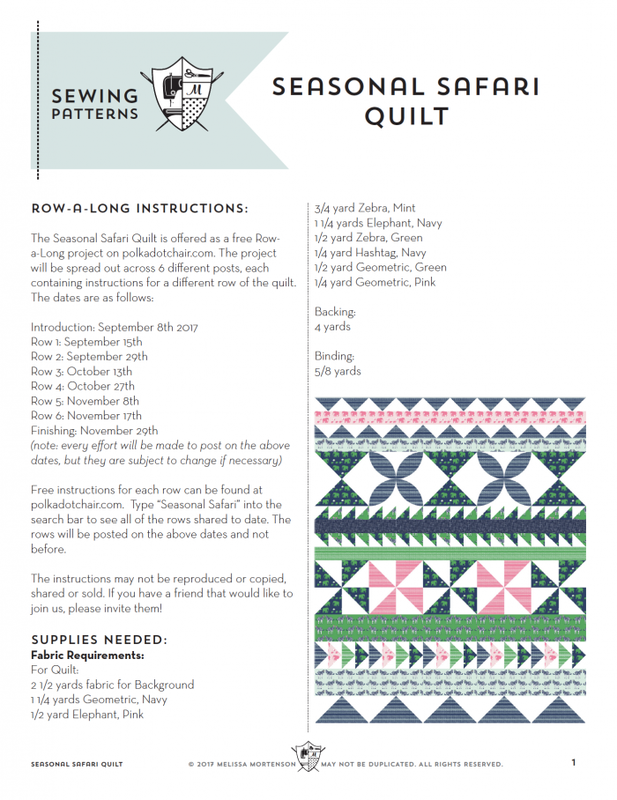 I want quilters from all skill levels to be able to participate so I’ve included instructions assuming that you only have limited quilting skills. One of the first things you need to learn is how to create a Half Square Triangle (HST) since there are a lot of HST’s in this quilt! So, this week we are starting with Row 4. Which is a row of pinwheel quilt blocks created using simple HST blocks. Also, you’ll notice there are several rows of just one print of fabric in the quilt. Those rows will be long pieced and are not included in the “weeks” since they are essentially serving as borders. 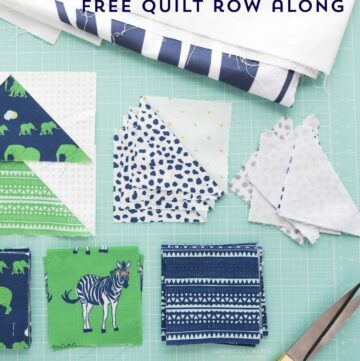 We will get to those rows in our last post which will tell you how to assemble your quilt top. You’ll also be able to purchase a PDF for a small fee at the end of the Row Along if you’d like a printed out copy to keep for your records. 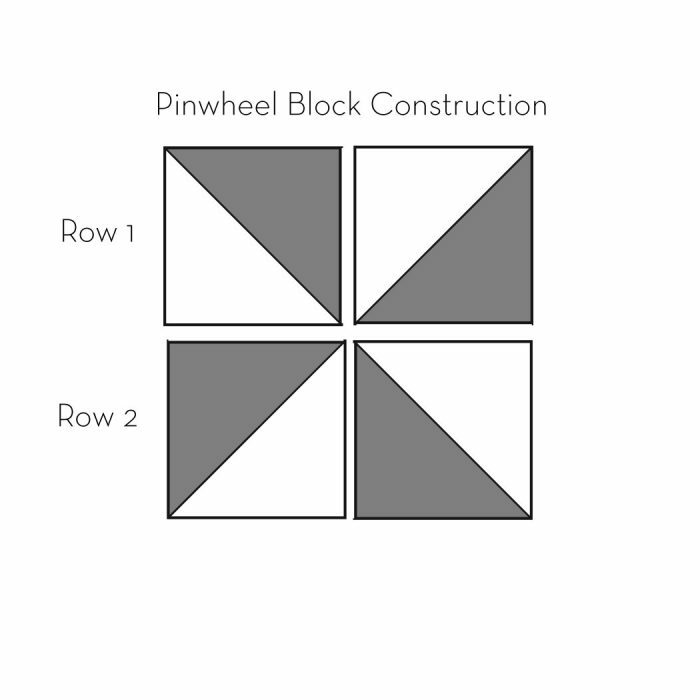 For Row 4 we will be making Five 12 1/2″ Pinwheel Blocks. 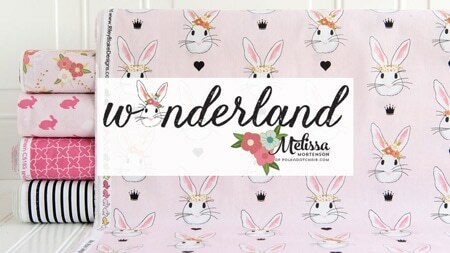 Begin by layering one 7″ x 7″ square from color 1 with one 7″ x 7″ square of background fabric, right sides facing. 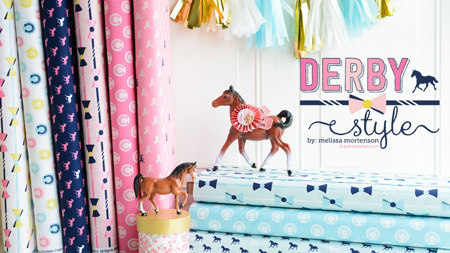 Draw a diagonal line down the center of the background fabric on the wrong side of the fabric. Stitch 1/4″ on each side of the line you drew. Cut in half using your rotary cutter along the line that you drew. 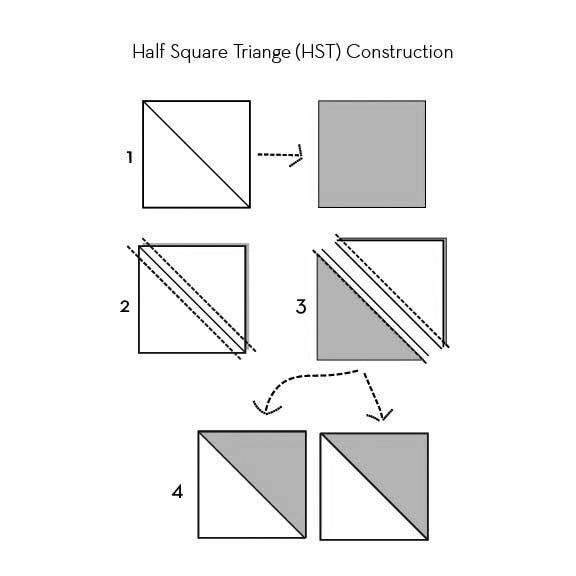 You should now have 2 Half Square Triangle Blocks (HST blocks). Trim each block up to 6 1/2″ x 6 1/2″. 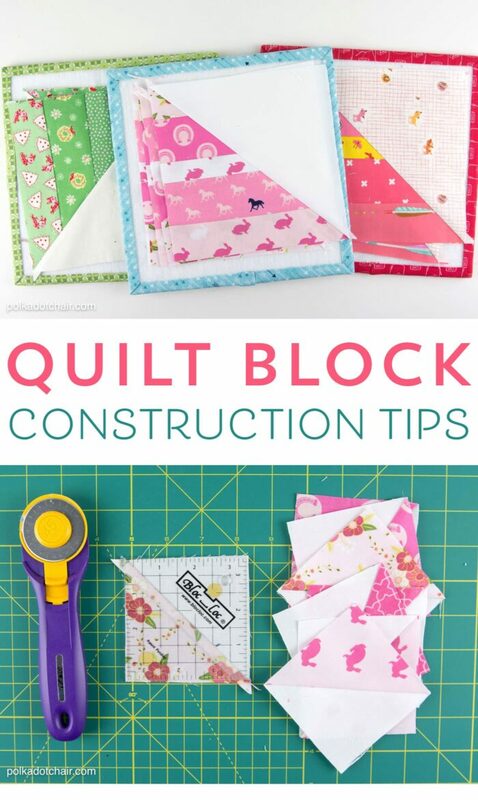 If you need help with how to trim your HST blocks, CLICK here for my post with tips for working with Quilt Blocks. Repeat 5 times with the rest of your color 1 fabric squares. Then repeat again using your 4 color 2 fabric squares. You should now have 12 sewn HST blocks from Color 1 and 8 sewn HST blocks from Color 2. You are now ready to create your Pinwheel Blocks. Stitch two HST’s sewn from color 1 together as shown in the diagram above (ROW1). Repeat, this time stitching them together as shown in ROW2. Press seams towards the darker fabric. Pin row 1 to row two, make sure you place a pin in the center seam. Stitch row 1 to row 2. 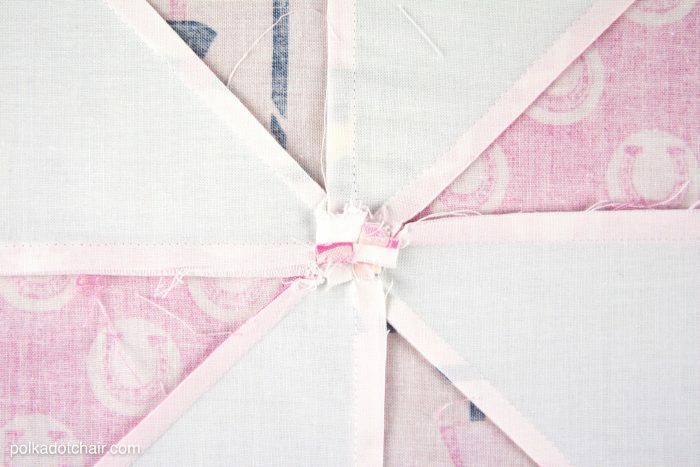 Since your seams are pressed in opposite directions they will “nest” together nicely when you sew them. You will want to reduce the bulk in the center of the block. 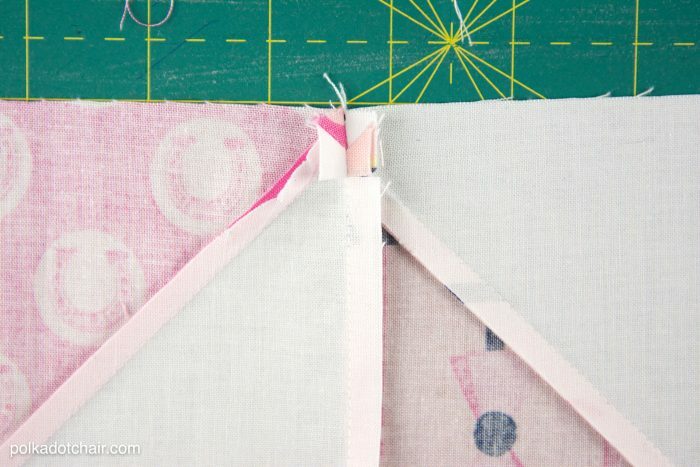 Clip 1/4″ in from the edge of the seam on all of the seams that meet in the center of the block. Make sure you don’t clip into the stitching line. 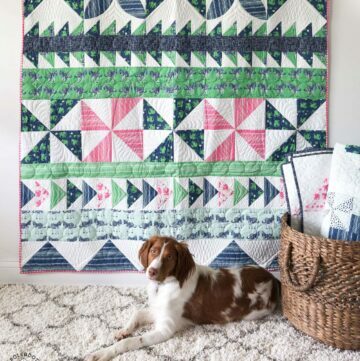 Repeat until you have sewn 5 pinwheel blocks. Stitch the blocks to each other along the side seams alternating blocks sewn from color 1 with blocks sewn from color 2. Next time we will stitch row 6. Until then! 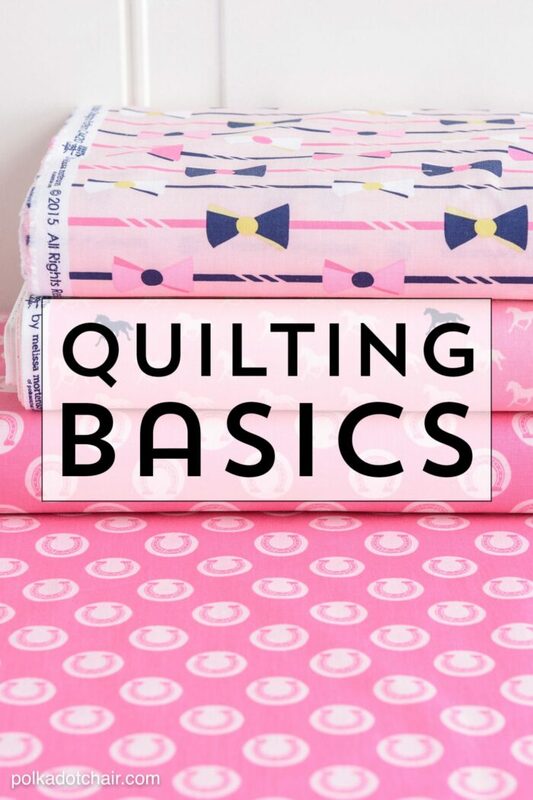 If you’re new to quilting make sure you check out these two posts before you start! 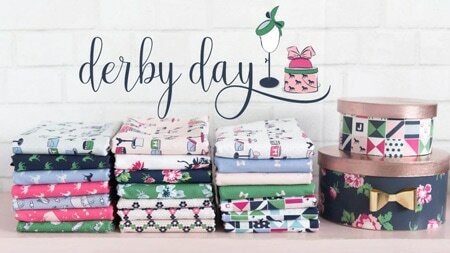 Working with Quilt Blocks- Tips and Tricks!